The information contained on our website does not constitute legal advice, is for general information purposes only, and is subject to change without notice. We make no representations or warranties of any kind, express or implied, about the completeness, accuracy, timeliness, performance, reliability, suitability or availability with respect to the website or the information, products, services, or related graphics contained on the website for any purpose. Your use of any information or content on this website is entirely at your own risk. It is your own responsibility to ensure that any products, services or information available through this website meet your specific requirements. The information provided on this site does not necessarily reflect the opinions, beliefs, findings, or experiences of aspiringheightsacademy.com. This website enables you to link to other websites which are not under the control of aspiringheightsacademy.com. These links are provided for your convenience to provide further information. The inclusion of these links does not signify that we endorse the websites. We have no responsibility for the content of the linked websites, and we have no control over the nature, content or availability of those websites. 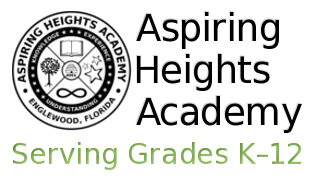 Every effort is made to keep this website up and running, however, aspiringheightsacademy.com takes no responsibility for, and will not be liable for, the website being temporarily unavailable due to technical issues beyond our control. You may always reach us at Aspiring Heights Academy, PO Box 1041, Englewood, FL 34295. IN NO EVENT WILL WE BE LIABLE FOR ANY LOSS OR DAMAGE INCLUDING WITHOUT LIMITATION INDIRECT, INCIDENTAL, OR CONSEQUENTIAL LOSS OR DAMAGE, OR ANY LOSS OR DAMAGE WHATSOEVER ARISING FROM THE LOSS OF DATA OR PROFITS ARISING OUT OF, OR IN CONNECTION WITH, THE USE OR LOSS OF USE OF THIS WEBSITE. This website contains material which is owned by or licensed to us. This material includes, but is not limited to, the design, layout, look, appearance, graphics, logos, page headers, button icons, and scripts. Reproduction is prohibited other than in accordance herein. Trademarks not owned by aspiringheightsacademy.com that appear on this site are the property of their respective owners. All trademarks reproduced in this website which are not the property of or licensed to aspiringheightsacademy.com are acknowledged on the website. You may download and/or print information from our website for personal, non-commercial purposes, provided that you maintain all copyright and other policies contained therein. Use our website or any content obtained from our website which is owned by or licensed to us to develop, or as a component of, any information, storage and retrieval system, database, or similar resource offered for commercial distribution of any kind, including through sale, license, lease, rental, subscription, or any other commercial distribution mechanism. Transmit any content that infringes any patent, trademark, copyright or other proprietary rights of any party.